18,000 NASA workers furloughed leaving about 600 on the job to service the ISS and monitor any current assembly projects as well as maintain minimal contact with satellites, probes, and rovers. Just think...Voyager 1 makes contact with aliens during the shutdown and we would never know of the encounter--JEEZE. "Government Shutdown Would Ground NASA 'Almost Entirely,' Obama Says"
NASA would be among those federal government agencies to experience a near total closure if the threatened government shutdown becomes reality on Oct. 1, U.S. President Barack Obama said Monday (Sept. 30). But a government shutdown should not endanger American astronauts currently in space. "NASA will shut down almost entirely, but Mission Control will remain open to support the astronauts serving on the space station," Obama said during a statement delivered from the White House. There are currently two NASA astronauts living on the International Space Station. Veteran astronaut Karen Nyberg has been living on the station since May and is midway through a months-long spaceflight. First-time space traveler Mike Hopkins, meanwhile, launched into space on Sept. 25 to begin his six-month stay. Nyberg and Hopkins are two of six crewmembers on the space station's current Expedition 37 crew. Italian astronaut Luca Parmitano and Russian cosmonauts Fyodor Yurchikhin, Oleg Kotov and Sergey Ryazanskiy. A government shutdown would begin on Tuesday (Oct. 1) if Congress fails to fund the federal government beyond the end of the current fiscal year, which ends today. NASA's government shutdown plan was released on Friday (Sept. 27). That plan includes closing down the majority of its operations and placing most if its thousands-strong workforce on furlough. Less than 600 of the space agency's 18,000 employees will continue working if a government shutdown does occur, NASA officials explained in the plan submitted to the Office of Management and Budget. "To protect the life of the crew as well as the assets themselves, we would continue to support planned operations of the ISS [space station] during any funding hiatus," the NASA plan states. "Moreover, NASA will be closely monitoring the impact of an extended shutdown to determine if crew transportation or cargo resupply services are required to mitigate imminent threats to life and property on the ISS or other areas." According to the plan, satellites and spacecraft currently in space will be maintained, though measurements, amazing photos and other data will have to be safeguarded for the duration of the shutdown. But spacecraft and satellites that have not yet been launched would likely be grounded or have work stop on those projects. "The extent of support necessary and the time needed to safely cease project activities will depend on whether any of the activities are of a hazardous nature (e.g., parts of the satellite may need to be cooled)," NASA's shutdown plan states. NASA currently has a fleet of active spacecraft and rovers exploring different parts of the solar system and beyond. Many satellites are orbiting the Earth to study our home planet, while other probes orbit the moon, Mercury, Mars and Saturn. NASA's Mars rover Curiosity and the smaller Opportunity rover are driving across the Martian surface. Still more spacecraft, like the Hubble Space Telescope and Spitzer Space Telescope, are peering deep into the universe, while other observatories, like the Solar Dynamics Observatory, study the sun. Other spacecraft are simply in transit, in the gulf between planets. NASA's New Horizons spacecraft is streaking through the outer solar system for a planned July 2015 flyby of Pluto. It launched in 2006. NASA's Juno spacecraft, meanwhile, has covered half of the distance it will travel on its mission to Jupiter. The probe launched in August 2011 and is expected to fly by Earth on Oct. 9 to grab a speed boost for the rest of its journey to Jupiter. Juno is due to arrive at Jupiter in July 2016 to study the planet in unprecedented detail. And then there is Voyager 1, the farthest manmade spacecraft in history. Voyager 1 is hurtling through interstellar space far from the political squabbles surrounding Tuesday's looming government shutdown. It entered interstellar space in August 2012 and is now 11.7 billion miles (18.8 billion kilometers) from Earth. 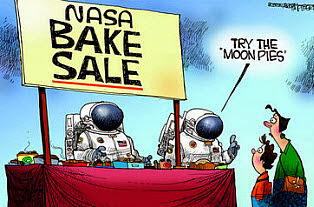 "NASA Hit by Government Shutdown"
Happy birthday, NASA. Now take today off. It may be the first of many such days, thanks to the federal government shutdown. As NASA celebrates the 55th anniversary of the start of its formal operations on October 1, 1958, roughly 97 percent of its workers are out on furlough today. They join thousands of other federal employees facing furloughs, with possible lost pay, due to the U.S. government shutdown resulting from Congress failing to approve a budget for federal agencies. At the high-profile space agency, mentioned by President Barack Obama in a Monday speech warning of the consequences of the stop in federal activities, the effects have been quickly felt. Websites for most of the agency's centers have become unavailable (except the site for the Jet Propulsion Laboratory in Pasadena, California, apparently), NASA alerts of dangerous asteroids have halted, and the November 18 launch of the MAVEN space mission to Mars may be delayed. "NASA will shut down almost entirely, but Mission Control will remain open to support the astronauts serving on the Space Station," Obama said in his speech. While Congress bickers, the 20-day launch window for the Mars Atmosphere and Volatile Evolution Mission (MAVEN) draws closer. The MAVEN spacecraft is an orbiter that will probe the Martian atmosphere. "The worse-case scenario is that MAVEN misses its launch opportunity to Mars," writes the Planetary Society's Casey Dreier. Launch windows to Mars—when Earth's orbit aligns with the red planet's, enabling a lower-cost trip—come around only once every 26 months. "If MAVEN cannot launch in time, it will have to wait for the next opportunity in early 2016, a delay that would cost NASA's Planetary Science Division tens of millions of dollars it cannot afford," Dreier says. Elsewhere at the space agency, the effects of the shutdown will become worse over time, says Keith Cowing of NASA Watch: "If they only lose a few days, then we lose a week of work, but over time there will be a satellite that has a problem or a design change that doesn't get fixed in time and we will see real impacts." Cowing suggests that shutting down the NASA websites immediately is a bit of an attention-grabbing device by the space agency, rather than a real necessity. "One thing to keep in mind is that the earlier federal sequester has already disrupted travel and a lot of planning at NASA already," says Cowing. "I think a lot of NASA employees are looking at this as just another burden, saying, 'Enough already. What's next?'" "Government shutdown stops MAVEN work; Threatens NASA Mars launch"
The upcoming Nov. 18 blastoff of NASA's next mission to Mars – the "breathtaking beautiful" MAVEN orbiter – is threatened by today's (Oct. 1) shutdown of the US Federal Government. And the team is very "concerned", although not yet "panicked." MAVEN's on time launch is endangered by the endless political infighting in Washington DC. And the bitter gridlock could cost taxpayers tens of millions of dollars or more on this mission alone! Why? Because launch preparations at NASA's Kennedy Space Center (KSC) have ceased today when workers were ordered to stay home, said the missions top scientist in an exclusive to Universe Today. "MAVEN is shut down right now!" Prof. Bruce Jakosky, MAVEN's principal Investigator, of the University of Colorado at Boulder, told Universe Today in an exclusive post shutdown update today. "Which means that civil servants and work at government facilities [including KSC] have been undergoing an orderly shutdown," Jakosky told me. The nominal interplanetary launch window for NASA's $650 Million MAVEN (Mars Atmosphere and Volatile EvolutioN Mission) mission to study the Red Planet's upper atmosphere only extends about three weeks until Dec. 7. Any launch delay could potentially add upwards of tens to hundreds of millions of dollars in unbudgeted costs to maintain the spacecraft and rocket – and that's money that NASA absolutely does not have in these fiscally austere times. MAVEN and much of NASA are not considered "essential" – despite having responsibility for hundreds of ongoing mission operations costing tens of billions of dollars that benefit society here on Earth. So about 97% of NASA employees were furloughed today. What's happening with the spacecraft right now? "The hardware is being safed, meaning that it will be put into a known, stable, and safe state," Jakosky elaborated. "We'll turn back on when told that we can. We have some margin days built into our schedule," Jakosky told me. "NASA: Government shutdown won't stop MAVEN launch to Mars"
Planetary scientists are breathing a sigh of relief as NASA’s MAVEN mission to Mars has been cleared for takeoff. The Mars Atmosphere and Volatile EvolutioN mission, slated for launch as early as Nov. 18, had been put on hold after this week's government shutdown, raising fears that the spacecraft would miss the launch window and be grounded for years. "I learned this morning that NASA has analyzed the MAVEN mission relative to the Anti-Deficiency Act and determined that it meets the requirements allowing an emergency exception," Bruce Jakosky, MAVEN’s lead scientist based out of the University of Colorado in Boulder, said in an email. MAVEN, set for launch between Nov. 18 and Dec. 7, will play a crucial role as a communications relay between Earth and the rovers Curiosity and Opportunity, Jakosky said. That’s a function currently carried out by two aging satellites, Mars Odyssey (launched in 2001) and the Mars Reconnaissance Orbiter (launched in 2005). "Wow, that’s good news," said UCLA planetary scientist David Paige, who was not involved in the mission. Paige said the mission had been on his mind all day. "The whole notion that they wouldn't launch this thing is just appalling," Paige said. "You have this whole rocket almost on the launchpad." In response to the government shutdown, NASA furloughed 97% of its roughly 18,000 workers, halting almost all but the most essential activities. The freeze left MAVEN’s team of scientists and engineers in a lurch – many of them had already flown from all over the country to NASA’s Kennedy Space Center in Cape Canaveral, Fla., to set up for the launch. Had MAVEN not escaped the funding freeze, the team could have pushed a launch to Dec. 15 at the latest, about a week after the end of its official launch window, Jakosky said. But beyond that, Earth and Mars would have fallen out of ideal alignment. "This would have precluded having sufficient fuel for MAVEN to carry out its science mission and to operate as a relay for any significant time," Jakosky said. This would have left the mission grounded for several years until the next available launch window. The MAVEN mission will explore the evolution of the Martian atmosphere, and will probe whether its cold, thin, dry shell of air was once thick and ideal for microbial life. In its elliptical orbit, it will swoop down to just 77 miles above the surface to taste each layer of the top of the atmosphere and then get a bird's eye view of the entire planet at its highest point, 3,728 miles above the planet. Although MAVEN was deemed necessary for technical support and not science values, the science would still benefit, Jakosky said. "Launching in 2013 allows us to observe at a good time in the 11-year solar cycle," he said. [Updated 6:10 p.m.: The spacecraft was shipped to the Kennedy Space Center on Aug. 2, giving the team three months to work through an enormous to-do list and get the spacecraft ready for launch. Among the list of more than a dozen tasks: Inspect, clean and prepare the spacecraft after shipping; reinstall parts that had been removed for the journey; load fuel; attach the spacecraft into the payload support structure and later to the Atlas and Centaur rockets; and roll the 5,622-pound craft out to the launchpad.